What is 'Helicopter Money' Policy? What is ‘Helicopter Money’ Policy? 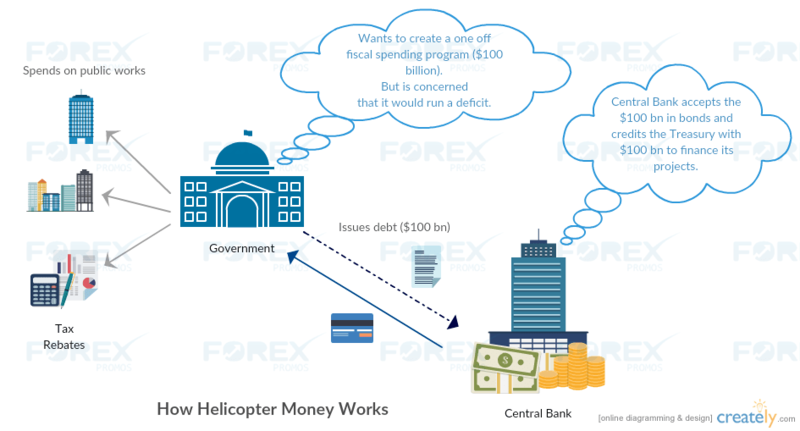 Helicopter Money is a proposed alternative in the world of easy monetary policy. One could be forgiven to mistake the term as a phenomenon where loads of money is simply dropped from a Helicopter. Helicopter Money is seen by many critics as the next step after Quantitative Easing. Helicopter Money, although might seem new to many has been around for years. The term is attributed to Milton Friedman and his parable of ‘Helicopter drop of money‘ in 1969. In this article you will learn how helicopter money works, how it can be implemented and more importantly, the distinction between quantitative easing and helicopter money. We will also take a look at some of the central banks that have unofficially spoke about helicopter money or have in recent times commented on the same. How does Helicopter Money Work? Helicopter money can be approached in two distinctive ways. The first means of policy emphasizes on permanent monetization of budget deficits or via a second means which involves the central bank engaging in direct transmission mechanisms to the private sector, financed by base money without the involvement of fiscal authorities (governments). This means of monetary policy, although sounds extreme is considered as the next step when conventional monetary policy tools such as interest rates or even QE have failed. The concept of Helicopter money in recent times was heard as early as in November 2001 when the then Federal Reserve Governor, Ben Bernanke, in his speech on preventing deflation. Helicopter money is seen as a necessary evil (if you can call it that) when traditional monetary policy tools such as Quantitative easing, Negative interest rates to name a few, fail to do the job. In a blog post by Ben Bernanke, he mentions that with new legislatures in advanced economies keeping governments from expanding fiscal spending for fear of running up an already high budget deficit, Bernanke makes the case where using helicopter money as the means to stoke inflation is essential. How can Helicopter Money be implemented? Issues such as integrating the approach to helicopter money with the standard monetary policy frame works and the challenge of achieving the required coordination between fiscal and monetary policy makers. Bernanke goes further to clearly explain how helicopter money can be implemented. For example, if the economy of a country was operating below its potential and with the central bank exhausting all its monetary policy tools, helicopter money could be used by the government approving a one off fiscal spending program. The amount of money, from this fiscal spending program is financed not by taxes but via the central bank. In such an instance, the fiscal spending budget is credited to the Treasury and the available funds can then be used to achieve its purpose. The government could then split the fiscal spending budget into public spending works and tax rebates. The treasury department could further issue the same amount of fiscal budget in debt which the central bank then agrees to purchase and hold for an indefinite period of time paying back any interest back to the Treasury. The above means is then used to increase public works spending by infrastructure development while at the same time allow for tax rebates which will see more disposable income among the households, thus eventually lifting inflation and growth higher by the above two means (served as a very basic example). Some critics say that Quantitative easing is almost similar to helicopter money, while others argue otherwise. It all comes down to perception. For example, quantitative easing is often seen as a policy tool used to inflate asset prices. A case in point has been the Fed’s many QE programs and the Bank of Japan’s QQE and the ECB’s QE, all of which have failed to have a sizeable impact on inflation but instead saw a noticeable impact on stock prices and equity markets. On the other hand, Helicopter money is seen as a direct mechanism used to influence consumer inflation by putting more money in people’s pockets, either by tax rebates or increased fiscal spending by governments. Richard Wood, from EconoMonitor puts it best. “One approach (large scale asset purchases and bond financed budget deficits) provides finance to bankers and finances speculation; produces asset price bubbles; artificially levels the yield curve and distorts risk pricing and risk assumption; creates capital outflows which can lead to instability abroad; denies insurance companies, superannuation funds and the retired and the elderly of safe interest returns; and results in competitive devaluation. Toby Nangle, head of multi-asset allocation at Columbia Threadneedle Investments says that central banks and governments have already started using helicopter money, which might differ in form but is essentially the same in function, in this Bloomberg report. According to Nangle, when a central bank engages in quantitative easing buying sovereign bonds while governments at the same time embark upon more fiscal spending, they together constitute de factor helicopter money. says Nangle and outlines a brief comparison between Quantitative easing, helicopter money and fiscal spending. 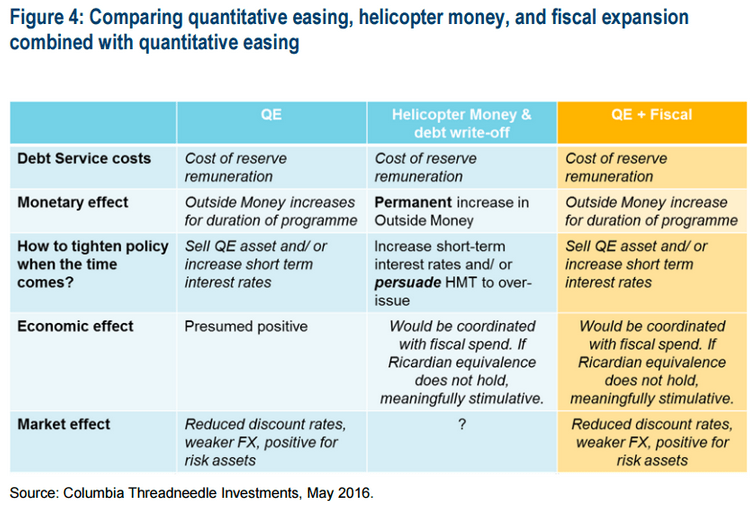 What impact would helicopter money have? Nangle further expands on Helicopter money by saying that when this policy tool is implemented, it might make the Central bank more difficult to normalize policy and could result in raising short term interest rates higher than they normally would. Furthermore, using such means is considered illegal in many countries (especially in advanced economies) and could result in hyper inflation. But again, the impact of helicopter money is simply unknown because it hasn’t yet been implemented in form, just as yet. So far, the European Central bank, the Swedish Riksbank and the Bank of Japan are a few of the developed economies central banks that have embarked on quantitative easing. The ECB more recently ventured into purchasing corporate bonds as a means to directly target the private sector. While we do not know yet if Helicopter money will ever be used, given the current trends and fears that central banks are reaching the limits of their monetary policy is reason enough to start thinking about Helicopter money. To sum up Helicopter money, here’s a youtube video of Friedman and his speech where he talks about monetary policy or click this link to read the paper. PrevWhat is the ECB’s Corporate Bond purchase program? Where will the next European Banking Authority be located? What is happening to the bond markets after a Trump victory?